The Importance Of A Good WordPress Theme - In Sales Now ! Once you decide to start with an online business, you have to consider the importance of a Good WordPress Theme and the advantages that it represents to your business, reputation and credibility. There are lots of free WordPress Themes, great ones that look good but probably, not all of them suits better the idea for your company, or they don’t match your colors or your logo. If you haven’t started your online business, please do! 🙂 you can check a guide to star for free by reading the Wealthy Affiliate Review. There are some basic differences between a free and a paid theme. The most common difference is that the PRO or Premium version of a free theme has many other features to customize your site. For example, you probably can select from a different palette of colors, different sidebars, location of sidebars, social media icons in the template or SEO features, among others. Responsive WordPress themes are other main characteristics of Pro themes, although many free themes came with this feature by default, if not, responsive is a must nowadays, that people look more information from their smartphones than from desktop computers. This may sound strange, but many pro themes can have some features that you usually get from a plugin. Some may have social media icons already inserted and then, you don’t have to install a plugin. Why is that so important? Because plugins need more processing capacity and make your site run slowly. If you have many plugins you hosting server may have some more tasks to do, your site will be slow. Of course you don’t want it because search engines consider this to rank your site and people don’t like to wait for a site to download. Nobody wants to visit a website that last 2 minutes to download! If the main idea of your site is to build an online store you may find pretty good themes with beautiful designs. If the site already comes with a WooCommerce app (for example) you don’t have to lok for e-commerce application, this will make your job easier. Those are medium-level complex problems. There are some simple examples like the one I said before, just to change colors, typos, logo, banners, etc., and you don’t have to be a HTML or CSS code expert. With the extra features, you probably don’t have to hire an expert so it will improve your costs. They could take your website beyond. Which theme should I buy? Well, it depends mostly of you and the things you want to do for your site. You’ll have to do some research. And of course, there are lots of different prices to consider, a Pro theme can be between $14 and $150, some of them can cost even more. But I have a recommendation. 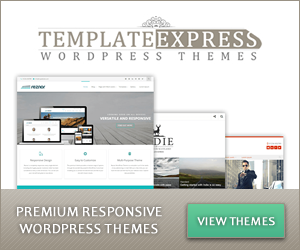 I recently acquired a group of themes from: Template Express WordPress Themes. The money will get paid just for the improvements your site will have, they will improve the User Experience and it means, more people enjoying your site, more people staying longer at your site, more conversions and of course, that means more money. At Template Express you can get one Premium theme for US$39, but you can get ALL of the PRO themes for just $59 (Feb 24th, 2016). And for that money, I can get more than 10 themes at my disposition. One of our sites, is Sports Big Fan, there is a real example of the Indie Pro Theme. It’s quite clean, great for SEO (the articles rank faster), social media icons, great typos, easy to read, it’s fast, etc. Another great one is Boys & Girls Clothes. This website has the Jess Theme. Great colors, handwriting typo, it is also very fast, very elegant and it fits the B&G niche. This is a pretty popular theme. Another one for example, it is in Spanish is MiSitio.Online. The theme is Formation Pro, and, as you can see in the demo it is pretty different from the site, which means you can customize it in so many aspects. Definitely, these kind of themes brings a better looking site. If you are writing great content, a great looking site will invite your customers or prospects to stay longer, and as I said before, it will bring more conversions and more money. Definitely, my recommendation is you invest a little money on a premium theme. It will make your life easier, your site will look more professional, it will run faster, SEO-friendly. The Template Express themes are great, take a look a their site, try their free themes but buy the whole packages, it’s a great price for such a great templates. 7 of my 12 sites are based on those themes and I will definitely use some more in the future. This is basically the Importance Of A Good WordPress Theme, as you get better looking sites and want more conversions from your leads.